We just got back from the Springfield Train Show. As many of you know, the factories in China that build our cars normally shut down each year for about three weeks to celebrate the Lunar New Year. So as soon as they reopen, we will start production of the blue K+S cars. When we did our last batch of Canpotex hoppers, we did a car for the club in Moose Jaw (Thunder Creek Model Railroad Club). They contacted us yesterday and asked if we would now do a blue K+S car for them with their Club Logo. After producing the Canpotex Club car we did for them last year, they realized they didn't make nearly enough. Now we know how popular these cars are. We have to give a final quantity to the factory by February 18th. It's a relatively short amount of time to promote this extra car. The Thunder Creek Club has already ordered enough cars to insure it will be produced. So if you are a customer of PWRS and would like one of these cars, you can either go to your Porters account or click on one of the cars below. 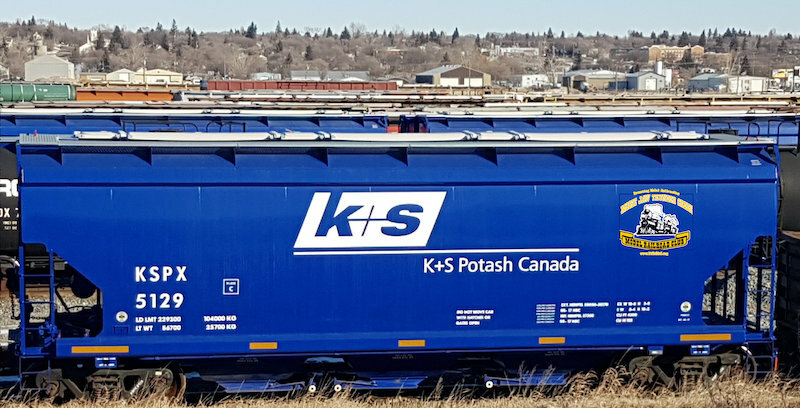 Remember: These new blue K+S cars will be used to transport potash to fertilizer plants all over Canada and the US. So it will not matter what class one you model, you will see them. We know from our reservations there is a lot of interest in the new blue K+S Cars coming soon from North American Railcar. One of our customers was recently in the Canadian Rockies near the Banff / Lake Louise area and shot a beautiful, long, exclusively K+S potash train on its way to the West Coast. By the way, we have made sure that the first 48 road numbers on the video are the exact car road numbers coming out from us on the first run. Now if only someone who makes AC4400's would do the 4 engines on the video you could have an awesome train! Be careful what you wish for!